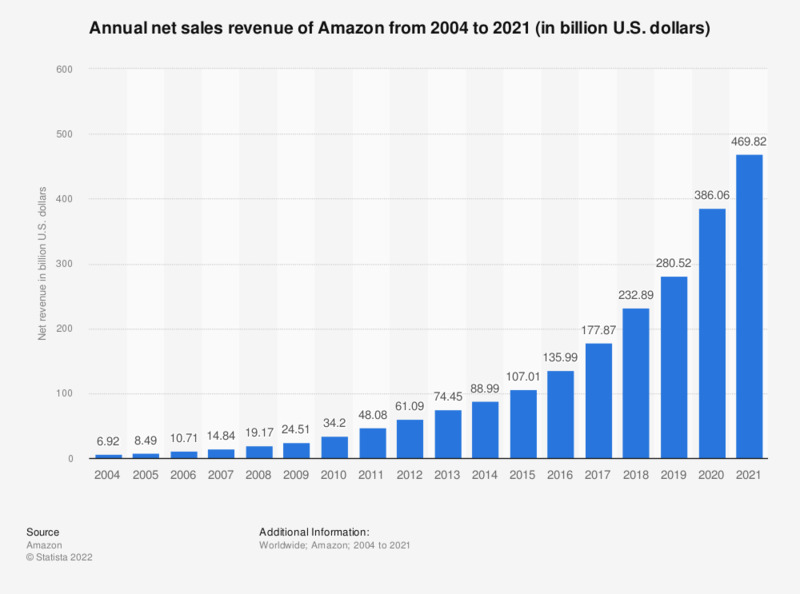 The time series shows the net revenue of Amazon.com's e-commerce and service sales from 2004 to 2018, in billion US dollars. In the last reported year, the multinational e-commerce company's net revenue was 232.88 billion U.S. dollars, up from 177.86 billion US dollars in 2017. Amazon.com, an American electronic commerce company originally founded in 1994, is the world’s largest online retailer of books, clothing, electronics, music and many more goods. As of 2017, the company generates the majority of it's net revenues through online retail product sales, followed by third-party retail seller services, retail subscription services including Amazon Prime, and AWS. Amazon is also the producer of the leading e-book reader, the Amazon Kindle. Through Amazon, consumers are able to purchase goods at a rather discounted price from both small and large companies as well as from other users. Both new and used goods are sold on the website. Due to the wide variety of goods available at prices which often undercut local brick-and-mortar retail offerings, Amazon has dominated the retailer market. As of 2018, Amazon’s brand worth amounts to approximately almost 207 billion U.S. dollars, topping the likes of companies such as Walmart, Ikea, as well as digital competitors Alibaba and eBay. One of Amazon's first forays into the world of hardware was its e-reader Kindle, one of the most popular e-book readers worldwide. In recently years, Amazon has also released smartphone, tablets and multimedia sticks under it's Fire brand in order to increase digital media consumption via these devices. This strategy is connected to the digital Amazon ecosystem which features video and audio content as value-added services for Prime subscribers. Due to its location, Amazon offers more services in North America than worldwide. As a result, the majority of the company’s net revenue in 2016 was actually earned in the United States and Canada. In 2017, approximately 106.11 billion U.S. dollars was earned in North America compared to only roughly 54.3 billion U.S. dollars internationally.